TraceView Plus is a fast and light-weight trace viewer designed for WPP Software Tracing and DbgPrint. WPP Software Tracing is a tracing technology from Microsoft primarily intended for debugging code during C/C++ development. With TraceView Plus you can create and view traces, and analyze them quickly. 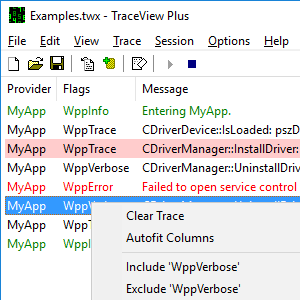 If you have not used Microsoft's WPP Software Tracing before, you definitely need to give it a try. Build upon the powerful Event Tracing for Windows (ETW) architecture, there is no technology that can deliver similar features and performance. If you are new to Windows Event Tracing and WPP, click here to learn more. When you create trace sessions, it is not unusual that thousands of trace messages are generated. In order to be able to quickly extract information from the trace, you will need to filter the trace records and highlight important information. With TraceView Plus, you have the necessary filter capabilities at your fingertips: You can define a list of include and exclude rules, with simply pattern matching or regular expression syntax. The sample filtering engine can be used to highlight specific trace records. You can specify up to ten filter sets that can be quickly selected with a keyboard shortcut, depending on the view you need. Creating trace sessions could not get any easier with TraceView Plus. 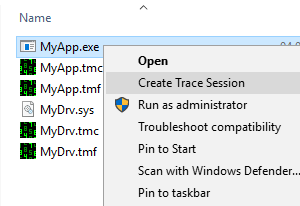 You can create trace sessions by simply double-clicking .pdb files,.exe or .dll files, or by opening a TraceView Plus project file. If your .pdb file changes because you have recompiled your application, you can have TraceView Plus automatically reload the .pdb file. Alternatively, you can specify the provider GUID, and TraceView Plus will automatically locate the proper .pdb files. Miscellaneous goodies such as file association, drag-and-drop support, resizable windows, QHD display support, text export via clipboard, etc.